Estrogen receptor-negative (ER-) breast cancer is a heterogeneous disease with limited therapeutic options. The molecular apocrine subtype constitutes 50% of ER-tumors and is characterized by overexpression of steroid response genes including androgen receptor (AR). We have recently identified a positive feedback loop between the AR and extracellular signal-regulated kinase (ERK) signaling pathways in the molecular apocrine subtype. In this feedback loop, AR regulates ERK phosphorylation through the mediation of ErbB2 and, in turn, ERK-CREB1 signaling regulates the transcription of AR in molecular apocrine cells. In this study, we investigated the therapeutic implications of the AR-ERK feedback loop in molecular apocrine breast cancer. We examined a synergy between the AR inhibitor flutamide and the MEK inhibitor CI-1040 in the molecular apocrine cell lines MDA-MB-453, HCC-1954 and HCC-202 using MTT cell viability and annexin V apoptosis assays. Synergy was measured using the combination index (CI) method. Furthermore, we examined in vivo synergy between flutamide and the MEK inhibitor PD0325901 in a xenograft model of the molecular apocrine subtype. The effects of in vivo therapies on tumor growth, cell proliferation and angiogenesis were assessed. We demonstrate synergistic CI values for combination therapy with flutamide and CI-1040 across three molecular apocrine cell lines at four dose combinations using both cell viability and apoptosis assays. 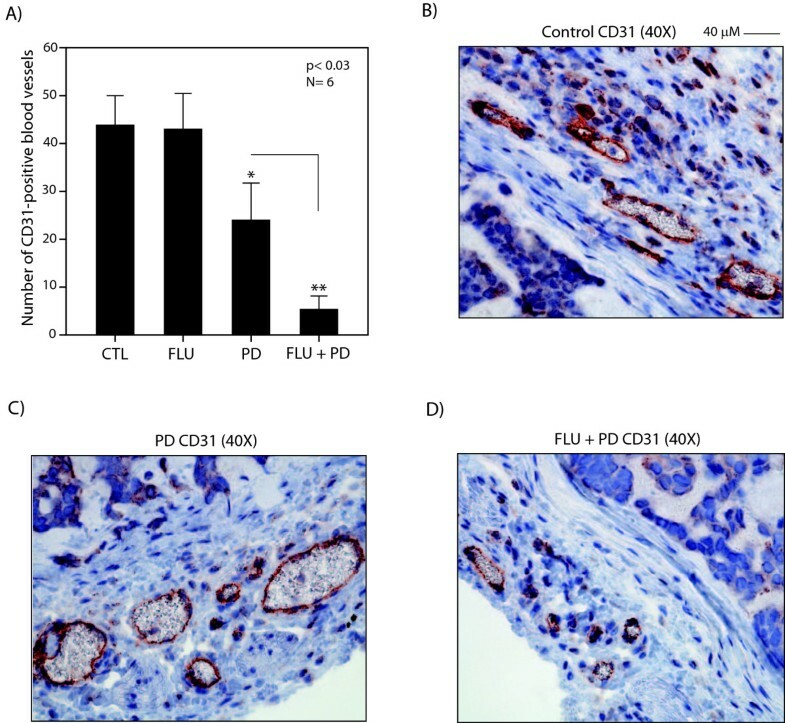 Furthermore, we show in vivo that combination therapy with flutamide and MEK inhibitor PD0325901 has a significantly higher therapeutic efficacy in reducing tumor growth, cellular proliferation and angiogenesis than monotherapy with these agents. Moreover, our data suggested that flutamide and CI-1040 have synergy in trastuzumab resistance models of the molecular apocrine subtype. Notably, the therapeutic effect of combination therapy in trastuzumab-resistant cells was associated with the abrogation of an increased level of ERK phosphorylation that was developed in the process of trastuzumab resistance. In this study, we demonstrate in vitro and in vivo synergies between AR and MEK inhibitors in molecular apocrine breast cancer. Furthermore, we show that combination therapy with these inhibitors can overcome trastuzumab resistance in molecular apocrine cells. Therefore, a combination therapy strategy with AR and MEK inhibitors may provide an attractive therapeutic option for the ER-/AR+ subtype of breast cancer. Estrogen receptor-negative (ER-) breast cancer constitutes around 30% of all cases with limited therapeutic targets available for this heterogeneous disease . In contrast to ER+ breast cancer, in which anti-estrogen therapy is an effective treatment strategy, current therapeutic options for advanced ER-breast cancer mostly rely on chemotherapeutic agents. Molecular profiling of ER-breast cancer broadly classifies this disease into basal and molecular apocrine subtypes . Molecular apocrine breast cancer constitutes approximately 50% of ER-tumors and is characterized by a steroid response gene signature that includes androgen receptor (AR) and a high frequency of ErbB2 overexpression [2–8]. For pathological classification, this subtype can easily be characterized as ER-/AR+ breast cancer [6–8]. In a recent study by Park et al. , AR expression was observed in 50% of ER-breast tumors and in 35% of triple-negative cancers. In addition, ErbB2 overexpression was present in 54% of ER-/AR+ tumors compared to 18% of the ER-/AR-group, which suggests a significant correlation between AR expression and ErbB2 overexpression in ER-tumors . Importantly, a growing body of evidence suggests that AR is a therapeutic target in molecular apocrine breast cancer [4, 5, 9]. In this regard, AR inhibition reduces cell viability and proliferation in molecular apocrine models [4, 5, 9]. In addition, an ongoing clinical trial has demonstrated that AR inhibition can stabilize disease progression in metastatic ER-/AR+ breast cancer . AR signaling has a significant role in the biology of molecular apocrine tumors. Notably, we have identified a functional cross-talk between the AR and ErbB2 signaling pathways in molecular apocrine cells that modulates cell proliferation and expression of steroid response genes . In addition, this cross-talk has been confirmed by a genome-wide meta-analysis study . Moreover, we have recently discovered a positive feedback loop between the AR and extracellular signal-regulated kinase (ERK) signaling pathways in molecular apocrine breast cancer . In this feedback loop, AR regulates ERK phosphorylation through the mediation of ErbB2, and, in turn, ERK-CREB1 signaling regulates the transcription of AR in molecular apocrine cells . The AR-ERK feedback loop has potential therapeutic implications in molecular apocrine breast cancer. In particular, due to the availability of effective AR and mitogen-activated protein kinase kinase (MEK) inhibitors, exploiting this feedback loop would provide a practical therapeutic approach. A number of AR inhibitors are currently used for prostate cancer, and their safety in a female patient population has been demonstrated in studies of breast and ovarian cancers [10, 13, 14]. Furthermore, several classes of MEK inhibitors have been developed and are now being examined in various clinical trials [15, 16]. Therefore, a potential positive outcome for the preclinical studies can readily be tested in future clinical trials. Here we carried out a preclinical study of combination therapy with AR and MEK inhibitors using in vitro and in vivo molecular apocrine models. Our results suggest that this combination therapy provides a promising therapeutic strategy in ER-/AR+ breast cancer. Breast cancer cell lines MDA-MB-453, HCC-202, and HCC-1954 were obtained from the American Type Culture Collection (Manassas, VA, USA). All the culture media were obtained from Invitrogen (Melbourne, VIC, Australia). MDA-MB-453 cell line was cultured in L15 media/10% fetal bovine serum (FBS). HCC-202 and HCC-1954 cells were cultured in RPMI 1640 media with 10% FBS. Cell cultures were carried out in a humidified 37°C incubator supplied with 5% CO2. The following treatments were applied for the cell culture experiments: (1) AR inhibitor flutamide (Sigma-Aldrich, Sydney, NSW, Australia) at 5 to 200 μM concentrations; (2) MEK inhibitor CI-1040 (PD184352) (Selleck Chemicals, Houston, TX, USA) at 2 to 30 μM concentrations; and (3) ErbB2 inhibitor trastuzumab (Roche, Sydney, NSW, Australia) at 10 to 80 μg/ml concentrations. Treatments with the inhibitors were performed in media containing FBS. MDA-MB-453, HCC-202 and HCC-1954 cells were grown in 96-well plates to 50% confluence followed by inhibitor treatments for 48 hours in full media. A solvent-only-treated group was used as a control. Cell viability was assessed using the Vybrant MTT Proliferation Assay Kit (Invitrogen) as previously described [5, 17]. Absorbance at 570 nm was measured for the experimental groups using a plate reader. MTT experiments were performed in eight biological replicates. Apoptosis measurement with flow cytometry was carried out using Annexin V-FITC Apoptosis Detection Kit I (BD Biosciences, Sydney, NSW, Australia). All experiments were performed in four biological replicates. Drug synergy was assessed using a combination index (CI) method as described before [9, 18]. We first measured cell viability and apoptosis for the combination therapies with flutamide and CI-1040 using MTT and annexin V assays, respectively. We next identified the concentrations of flutamide and CI-1040 monotherapies, which resulted in a level of reduction in cell viability and apoptosis similar to that observed with each of the combination therapy conditions. Subsequently, CI for the combined treatments were calculated as follows: CI = [Ca,x/ICx,a] + [Cb,x/ICx,b], Ca,x and Cb,x are the concentrations of drug A and drug B used in combination to achieve x% drug effect . ICx,a and ICx,b are the concentrations for single agents to achieve the same effect. A CI less than 1 indicates synergy with the combination therapy. Animal ethics approval was obtained for the project, and mice were maintained in accordance with the Institutional Animal Care guidelines. Six-week-old female nonobese diabetic/severe combined immunodeficient mice were purchased from Animal Resource Center (Perth, WA, Australia). The methodology for generating the tumors in mice was performed as previously described [9, 12]. A total of 5 × 106 MDA-MB-453 cells were injected into the flank of each mouse to generate the xenograft tumors . Drug treatments were initiated 7 days after the cell injections. Flutamide treatment was carried out with 25 mg/60-day slow-release flutamide pellets (Innovative Research of America, Sarasota, FL, USA), and the control group received placebo pellets (Innovative Research of America). MEK inhibitor treatment was carried out with daily oral gavage of PD0325901 (Selleck Chemicals) at 5 to 20 mg/kg/day as described before . PD0325901 was prepared at a stock concentration of 50 mg/ml in dimethyl sulfoxide (DMSO) (Sigma-Aldrich) and made up to the daily working concentration in 0.05% methylcellulose/0.02% Tween 80 (Sigma-Aldrich). The control group received daily gavage of a volume of DMSO equal to that of the treatment group in the same carrier solution. The tumor volumes were assessed every 3 days by measuring the length (l) and width (w) and then calculating the volume as π/6 × l × w × (l + w)/2 as described before . Xenograft tumors were harvested 30 days following the start of treatments. Fold change in tumor volume was calculated as [volume on treatment day 30/volume on treatment day 1]. Harvested tumors were fixed in formalin and embedded in paraffin for immunohistochemistry (IHC) staining. We assessed toxicity to MEK inhibitor in mouse xenograft model by measuring body weight change during 30 days of treatment with PD0325901 at 5 to 20 mg/kg/day. The control group received daily gavage of carrier solution. Xenograft experiments were carried out as explained before, and two mice were treated per each treatment group. Mice were weighed daily during the course of treatment. In the event of weight reduction for two consecutive days, drug was withheld until weight stabilized before therapy reinitiation. Toxicity was evaluated by the measurement of (1) weight change pre- and post-treatment in each group and (2) number of treatment days lost due to weight reduction or mortality. IHC staining was performed using EnVision+ System-HRP (AEC, DakoCytomation, Melbourne, VIC, Australia) following the manufacturers' instruction. Antigen retrieval was carried out using Target Retrieval Solution (DakoCytomation). Rabbit polyclonal Ki-67 and rabbit polyclonal CD31 antibodies were obtained from Abcam (Cambridge, UK). Primary antibody incubation was carried out at 1:50 dilution for each antibody. Slides were counterstained with hematoxylin (Sigma-Aldrich) and mounted using Glycergel Mounting Medium (DakoCytomation). For IHC scoring, slides were examined using a light microscope at ×60 magnification (Nikon Instruments Inc., Tokyo, Japan). The percentage of cells showing Ki-67 nuclear staining in a total of 600 cells was calculated as the proliferation index for each tumor. The total number of CD31-positive blood vessels in a tumor cross-section was counted to measure angiogenesis in each sample. Scoring was carried out separately by two investigators, and the average scores were used for the final analysis. To generate a trastuzumab-resistant line, MDA-MB-453 cells were continuously cultured with increasing doses of trastuzumab at 10 to 20 μg/ml concentrations for 90 days. The MDA-MB-453 control line was treated with solvent only and grown for the same duration. Cell viability of resistant and control lines were assessed using MTT assay. Rabbit monoclonal ERK1/2 and phospho-ERK1/2 (Thr202/Tyr204) antibodies were obtained from Cell Signaling Technology (Danvers, MA, USA). Western blot analysis was carried out at 1:1,000 dilution of each primary antibody using 10 μg and 20 μg of cell lysates for total and phospho-ERK1/2, respectively. Protein concentrations from the cell isolates were measured using BCA Protein Assay Kit (Thermo Scientific, Melbourne, VIC, Australia). Rabbit polyclonal α-tubulin antibody (Abcam) was used as loading control. Analysis of band densities was performed using Bio-Profil Densitometer Software (Vilber Lourmat, Eberhardzell, Germany). Fold changes in band densities were measured relative to the control groups. Western blot analysis was done in two biological replicates, and the average fold change was shown for each set of experiments. Biostatistical analysis was done using the SPSS version 17.0 statistical software package (SPSS, Inc., Chicago, IL, USA). The Mann-Whitney U test was applied for the comparison of nonparametric data. 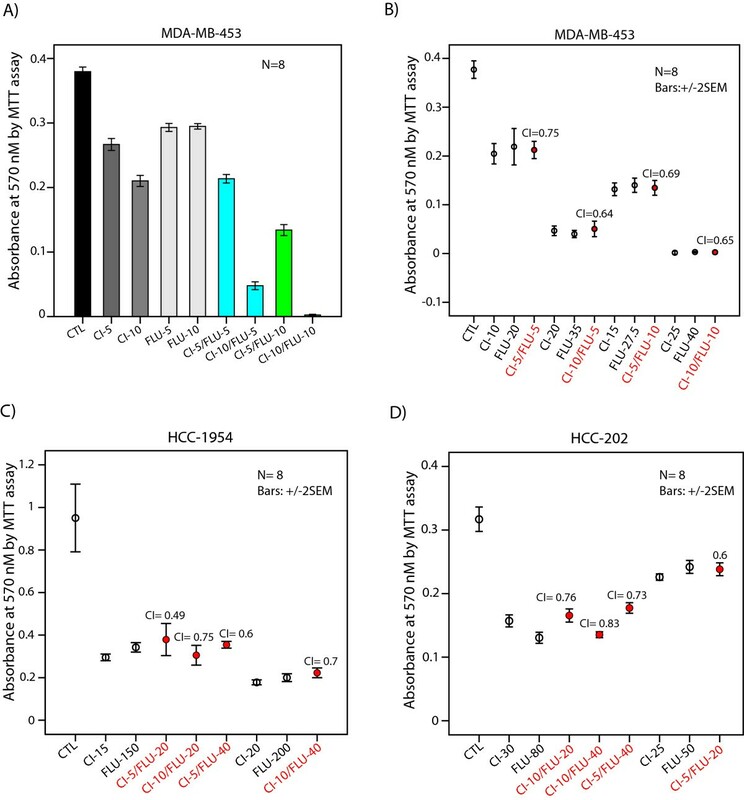 To assess a potential synergy between the AR inhibitor flutamide and the MEK inhibitor CI-1040, we used previously characterized molecular apocrine cell lines MDA-MB-453, HCC-1954 and HCC-202 [5, 9]. CI-1040 has been commonly used to examine the effects of MEK inhibition on cell lines, and therefore it was chosen for in vitro experiments in this study [21–23]. The effect of monotherapies with flutamide at 5 to 200 μM and CI-1040 at 2 to25 μM concentrations on cell viability of molecular apocrine lines was assessed by MTT assay. We observed that monotherapies with these inhibitors reduced cell viability in a dose-dependent manner across three cell lines (Figures 1A to 1F and 2A to 2D). The effect of flutamide and CI-1040 on cell viability of molecular apocrine lines. (A) MTT assay to measure cell viability in MDA-MB-453 cell line after treatment with flutamide (FLU) at 5 to 30 μM concentrations. CTL: control. (B) MTT assay to measure cell viability in MDA-MB-453 cell line after treatment with CI-1040 (CI) at 2 to 25 μM concentrations. (C) MTT assay to measure cell viability in HCC-1954 cell line after treatment with flutamide at 10 to 100 μM concentrations. (D) MTT assay to measure cell viability in HCC-1954 cell line after treatment with CI-1040 at 2 to 25 μM concentrations. (E) MTT assay to measure cell viability in HCC-202 cell line after treatment with flutamide at 10 to 100 μM concentrations. (F) MTT assay to measure cell viability in HCC-202 cell line after treatment with CI-1040 at 2 to 25 μM concentrations. All error bars: ± 2 SEM. Synergistic effect of AR and mitogen-activated protein kinase kinase inhibitors on cell viability. (A) MTT assay to measure cell viability in MDA-MB-453 cell line after monotherapies and combination treatments with flutamide (FLU) and CI-1040 (CI) at 5 and 10 μM concentrations. CTL: control. Error bars: ± 2 SEM. (B) Combination indices (CI) for flutamide and CI-1040 combination therapy in MDA-MB-453 cell line using MTT assay. Cell viability was measured after combination therapies with flutamide at 5 and 10 μM with each concentration of CI-1040 at 5 and 10 μM. The concentrations of FLU and CI-1040 monotherapies with an effect similar to that of each combination therapy are depicted. Error bars: ± 2 SEM. (C) Combination indices for flutamide and CI-1040 combination therapy in HCC-1954 cell line using MTT assay. Cell viability was measured after combination therapies with flutamide at 20 and 40 μM with each concentration of CI-1040 at 5 and 10 μM. 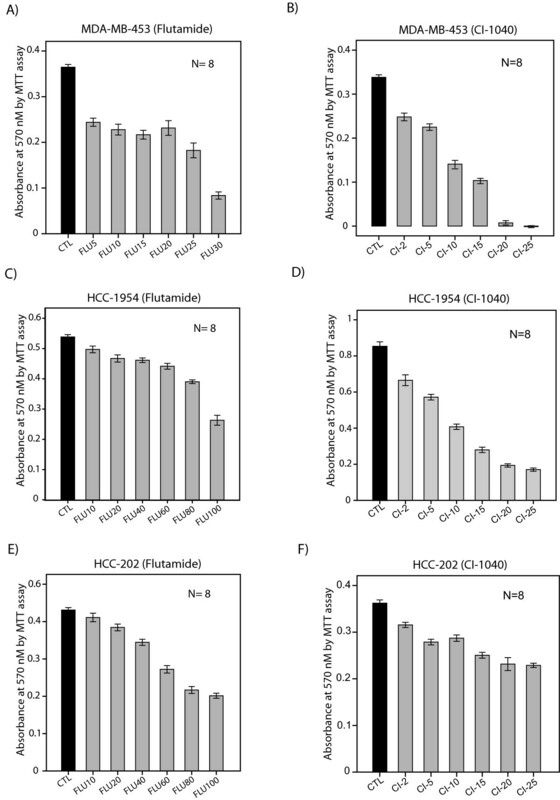 (D) Combination indices for flutamide and CI-1040 combination therapy in HCC-202 cell line using MTT assay at concentrations described in Figure 2C. It is notable that MDA-MB-453 cells were relatively more sensitive to flutamide treatment compared to the HCC-1954 and HCC-202 lines. In MDA-MB-453 cells, flutamide at 30 μM concentration reduced cell viability by approximately 75% compared to control (Figure 1A). However, in HCC-1954 and HCC-202 cell lines, there was a 50% reduction in cell viability with flutamide at 100 μM concentration (Figure 1C and 1E). Furthermore, HCC-202 cells were relatively less sensitive to CI-1040 treatment compared to the other two cell lines. 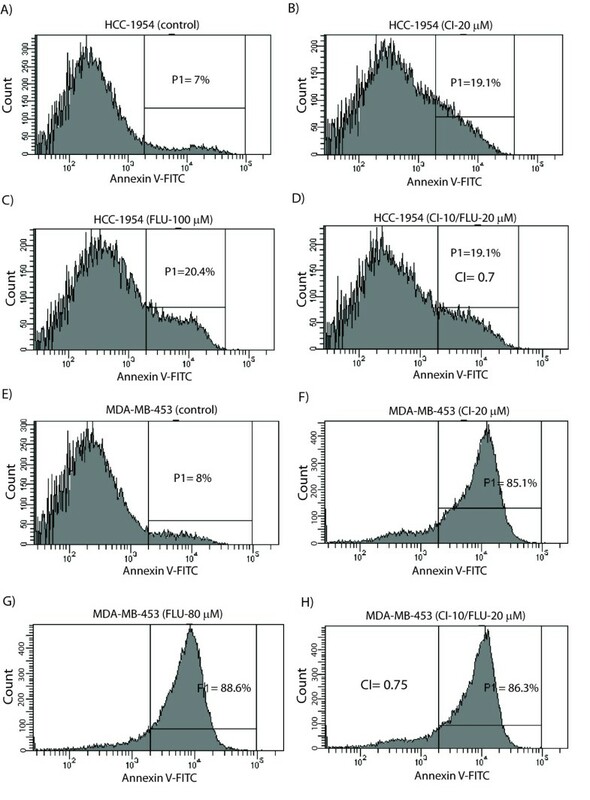 In this respect, CI-1040 at 25 μM concentration reduced cell viability by over 75% in MDA-MB-453 and HCC-1954 cells compared to an approximately 30% reduction in the HCC-202 line (Figure 1B, D and 1F). Next, we calculated CI values for the combined therapy with flutamide and CI-1040 at four dose combinations in each cell line (Figure 2). In MDA-MB-453 cell line, which had a high level of sensitivity to flutamide, this drug was applied at 5 and 10 μM in combination with CI-1040 at 5 and 10 μM concentrations (CI-1040 (5 μM)/flutamide (5 μM), CI-1040 (10 μM)/flutamide (5 μM), CI-1040 (5 μM)/flutamide (10 μM), and CI-1040 (10 μM)/flutamide (10 μM)). In HCC-1954 and HCC-202 cell lines, flutamide at 20 and 40 μM concentrations was assessed for synergy in combination with CI-1040 at 5 and 10 μM concentrations (CI-1040 (5 μM)/flutamide (20 μM), CI-1040 (10 μM)/flutamide (20 μM), CI-1040 (5 μM)/flutamide (40 μM), and CI-1040 (10 μM)/flutamide (40 μM)). Importantly, we observed a synergy at all four dose combinations across three cell lines. In MDA-MB-453 cell line, CI values for the combination therapy with flutamide and CI-1040 were 0.64 to 0.75 (Figure 2B). Furthermore, in HCC-1954 and HCC-202 lines, CI values for the combination therapy were 0.49 to 0.75 and 0.6 to 0.83, respectively (Figure 2C and 2D). These data suggest that AR inhibitor flutamide and MEK inhibitor CI-1040 have synergy in reducing cell viability of molecular apocrine cell lines. To further investigate the synergy between flutamide and CI-1040, we assessed the effect of this combination therapy on apoptosis in molecular apocrine cell lines. Apoptosis was detected using annexin V assay and analyzed by flow cytometry. Using this approach, we calculated CI values for the combination therapy with flutamide and CI-1040 at four dose combinations in each cell line. CI-1040 was applied at 5 and 10 μM in combination with flutamide at 20 and 30 μM concentrations (CI-1040 (5 μM)/flutamide (20 μM), CI-1040 (10 μM)/flutamide (20 μM), CI-1040 (5 μM)/fluatmide (30 μM), and CI-1040 (10 μM)/flutamide (30 μM)). Notably, we observed synergy at all four dose combinations in molecular apocrine cell lines. In HCC-1954 and MDA-MB-453 cell lines, CI values for the combination therapy were 0.7 to 0.8 and 0.65 to 0.75, respectively (Figure 3A to 3H and Table 1). Furthermore, in the HCC-202 cell line, CI values for the combination therapy were 0.6 to 0.75 (Figure 4A to 4D and Table 1). Therefore, we can conclude that AR inhibitor flutamide and MEK inhibitor CI-1040 have synergy in the induction of apoptosis in molecular apocrine cell lines. Synergistic induction of apoptosis by AR and mitogen-activated protein kinase kinase inhibitors in HCC-1954 and MDA-MB-453 cell lines. 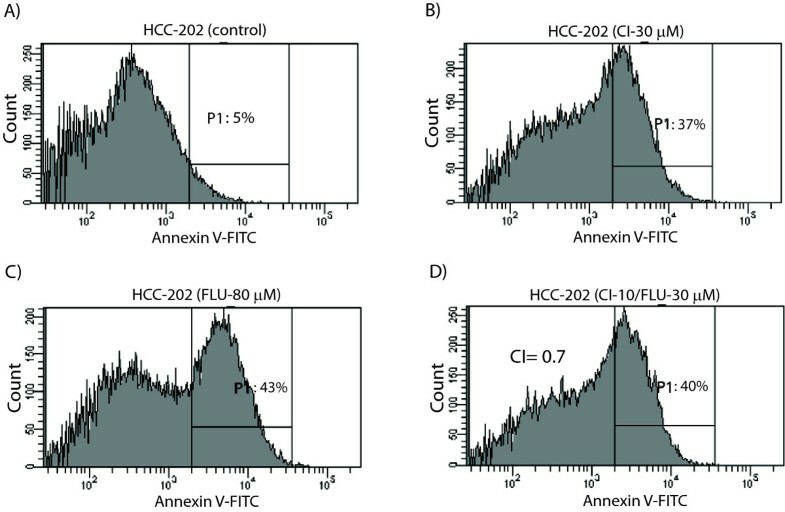 (A) Histogram showing the percentage of apoptosis (P1) in control (solvent-only treated) HCC-1954 cell line using annexin V-FITC flow cytometry. (B) Histogram showing the percentage of apoptosis following CI-1040 treatment at 20 μM (CI 20 μM) in HCC-1954 cell line. (C) Histogram showing the percentage of apoptosis following flutamide (FLU) treatment at 100 μM in HCC-1954 cell line. (D) Histogram showing the percentage of apoptosis following combination therapy with CI-1040 at 10 μM and flutamide at 20 μM in HCC-1954 cell line. Combination index (CI) is calculated using the concentrations of monotherapies with these agents as shown in Figures 3B and 3C that induced a level of apoptosis similar to that of combination therapy. (E) Histogram showing the percentage of apoptosis in control MDA-MB-453 cell line. (F) Histogram showing the percentage of apoptosis following CI-1040 treatment at 20 μM in MDA-MB-453 cell line. (G) Histogram showing the percentage of apoptosis following flutamide treatment at 80 μM in MDA-MB-453 cell line. (H) Histogram showing the percentage of apoptosis and CI following combination therapy with CI-1040 at 10 μM and flutamide at 20 μM in MDA-MB-453 cell line. CI: combination index, FLU: flutamide. CI-1040 and flutamide concentrations are shown in μM. Synergistic induction of apoptosis by AR and MEK inhibitors in HCC-202 cell line. (A) Histogram showing the percentage of apoptosis (P1) in control (solvent-only treated) HCC-202 cell line using annexin V-FITC flow cytometry. (B) Histogram showing the percentage of apoptosis following CI-1040 treatment at 30 μM (CI-30 μM) in HCC-202 cell line. (C) Histogram showing the percentage of apoptosis following flutamide (FLU) treatment at 80 μM in HCC-202 cell line. (D) Histogram showing the percentage of apoptosis following combination therapy with CI-1040 at 10 μM and flutamide at 30 μM in HCC-202 cell line. CI is calculated using the concentrations of monotherapies with these agents as shown in Figures 4B and 4C that induced a level of apoptosis similar to that of combination therapy. We investigated the in vivo toxicity of PD0325901 to identify a tolerable dose of this MEK inhibitor for xeonograft studies. PD0325901 is a potent MEK inhibitor with chemical characteristics similar to that of CI-1040; however, a better oral bioavailability makes this agent more suitable for in vivo studies [19, 24]. Following xenografts with MDA-MB-453 cells, mice were treated with daily oral gavage of PD0325901 at 5, 10, 15 and 20 mg/kg/day for 30 days. Daily gavage of carrier solution was used as control. Toxicity was evaluated by the measurement of weight change during treatment and number of treatment days lost due to weight reduction or mortality as described in Materials and methods. We observed a significantly higher weight gain in mice treated with PD0325901 at 5 and 10 mg/kg/day doses compared to the control group (P < 0.01, Figure 5A). Importantly, treatments with higher doses of PD0325901 at 15 and 20 mg/kg/day resulted in a significant weight reduction compared to the lower doses of this agent (P < 0.01, Figure 5A). Furthermore, the number of treatment days lost due to toxicity was significantly lower with PD0325901 doses of 5 and 10 mg/kg/day compared to that of 15 and 20 mg/kg/day (P < 0.01, Figure 5B). Notably, PD0325901 treatment at 5 mg/kg/day did not result in any measurable toxicity using this approach (Figure 5A and 5B). These findings indicate that PD0325901 treatment at lower doses is significantly less toxic than higher doses of this agent in a xenograft mouse model. Assessment of in vivo toxicity to MEK inhibitor PD0325901. (A) Weight change in grams is shown for each PD0325901 (PD) treatment group in the MDA-MB-453 xenograft model. Weight change is the difference between pre- and post-treatment weight in each group. PD0325901 treatments were carried out at 5, 10, 15 and 20 mg/kg/day for 30 days, and daily gavage of carrier solution was used as control. *P < 0.01 for PD-5/PD-10 vs. control groups and PD-5/PD-10 vs. PD-15/PD-20 groups using Mann-Whitney U test. Error bars: ± 2 SEM. (B) Number of days lost due to toxicity is shown for each PD0325901 treatment group in mouse xenograft model explained in Figure 5A. *P < 0.01 for PD-5/PD-10 vs. PD-15/PD-20 groups. To further assess the therapeutic efficacy of combined AR and MEK inhibition in molecular apocrine breast cancer, we generated xenograft tumors using MDA-MB-453 cell line. This cell line was chosen for the xenograft studies because it is a prototype of molecular apocrine subtype and has been previously employed for in vivo studies of the AR-ERK feedback loop [4, 5, 9, 12]. PD0325901 treatment was carried out at 5 mg/kg/day based on the results of our toxicity studies. Mouse treatments were carried out in the following four groups: (1) placebo pellet and daily oral gavage of carrier solution (control group), (2) flutamide 25 mg/60 days pellet + gavage of carrier solution (flutamide monotherapy), (3) daily oral gavage of PD0325901 at 5 mg/kg/day + placebo pellet (PD0325901 monotherapy) and (4) flutamide pellet + PD0325901 (combination therapy). Six mice were treated in each experimental group for 30 days, and fold change in tumor volume was calculated as described in Materials and methods. We observed a threefold lower tumor volume change in the combination therapy group compared to that of control (P < 0.01, Figure 6A). Importantly, mice treated with combination therapy had approximately 2.5-fold lower tumor growth compared to that of monotherapy groups (P < 0.01, Figure 6A and 6B). The therapeutic effects of AR and MEK inhibitors on in vivo tumor growth and cellular proliferation. (A) Fold change in tumor volume is shown for each in vivo treatment group using MDA-MB-453 xenograft model. CTL: control group; FLU: flutamide; PD: PD0325901. *P < 0.01 for the combination therapy group vs. control or monotherapy groups using Mann-Whitney U test. Error bars: ± 2 SEM. (B) Representative image of xenograft tumors in flutamide monotherapy and combination therapy groups. (C) Immunohistochemistry (IHC) was used to measure the proliferation index in a control xenograft tumor. Staining was carried out using a Ki-67 rabbit polyclonal antibody. Original magnification, ×60. (D) IHC was used to measure Ki-67 proliferation index in a xenograft tumor treated with the combination therapy. Original magnification, ×60. (E) Tumor proliferation indices using Ki-67 nuclear staining for the xenograft experiments. *P < 0.05 for monotherapy groups vs. control and **P < 0.05 for combination therapy vs. monotherapy groups. Error bars: ± 2 SEM. We next investigated the effect of different in vivo treatments on cellular proliferation and angiogenesis using harvested xenograft tumors. Proliferation index and angiogenesis were assessed with IHC using Ki-67 and CD31 antibodies, respectively. The results were then compared between different in vivo therapy groups. Notably, we observed a proliferation index of 22% ± 2 in tumors treated with the combination therapy, which was significantly lower than that of control (56% ± 2) and monotherapy groups (flutamide: 39% ± 3, PD0325901: 31% ± 4), (P < 0.05, Figure 6C to 6E). Furthermore, angiogenesis was significantly lower in the combination therapy group with a CD31-positive blood vessel count of 5.3 ± 3 compared to that of control (44 ± 6) and monotherapy groups (flutamide: 43 ± 7, PD0325901: 24 ± 7) (P < 0.03, Figure 7A to 7D). Moreover, CD-31-positive blood vessels in the combination therapy group were smaller and less distinct than those in other groups (Figure 7B to 7D). The therapeutic effect of AR and MEK inhibitors on in vivo angiogenesis. (A) Angiogenesis index for each in vivo treatment group. Angiogenesis was measured as the number of CD-31-positive blood vessels in a cross-section of each xenograft tumor. CTL: control group; FLU: flutamide; and PD: PD0325901. *P < 0.03 for PD0325901 monotherapy vs. control and **P < 0.03 for combination therapy vs. monotherapy groups using Mann-Whitney U test. Error bars: ± 2 SEM. (B) Immunohistochemistry (IHC) was used to measure angiogenesis in a control xenograft tumor. Staining was performed using a CD31 rabbit polyclonal antibody. Original magnification, × 40. (C) IHC was used to measure angiogenesis in a PD0325901 monotherapy tumor. Original magnification, × 40. (D) IHC was used to measure angiogenesis in a xenograft tumor treated with combination therapy. Original magnification, × 40. These findings indicate that the combination therapy with fluatmide and PD0325901 has a significantly higher level of in vivo activity in the reduction of xenograft tumor growth, cellular proliferation and angiogenesis compared to that of monotherapies with these agents. It is also notable that flutamide and PD0325901 monotherapies did not significantly reduce tumor growth compared to the control group (Figure 6A and 7A). Therefore, a significantly higher efficacy in the combination therapy group compared to that of monotherapies suggests an in vivo synergy between fluatmide and PD0325901. It is known that at least 50% of ER-/AR+ breast tumors have ErbB2 overexpression, and anti-ErbB2 treatment is an established part of management for this subgroup [7, 8, 25]. Importantly, trastuzumab resistance is a major clinical problem in this patient population . Therefore, we investigated the activity of combination therapy with flutamide and CI-1040 in overcoming trastuzumab resistance using molecular apocrine cell lines MDA-MB-453 and HCC-1954 with known ErbB2 overexpression [5, 9]. We first examined the effect of trastuzumab treatment at 10 to 80 μg/ml concentrations for 48 hours on cell viability of MDA-MB-453 and HCC-1954 lines using MTT assay. A solvent-only-treated group was used as control. We observed a significant reduction in cell viability by approximately 40% following trastuzumab treatments in MDA-MB-453 cell line (P < 0.01, Figure 8A). In addition, trastuzumab activity reached a plateau at 10 μg/ml concentration without any additional reduction in cell viability at higher concentrations of this agent (Figure 8A). Furthermore, HCC-1954 cell line showed an intrinsic resistance to trastuzumab treatment with no significant reduction in cell viability at any of the tested concentrations (Figure 8B). Synergy between AR and MEK inhibitors in trastuzumab-resistant cells. (A) MTT assay was used to measure cell viability in MDA-MB-453 cell line following trastuzumab treatment at 10 to 80 μg/ml concentrations. CTL: control. *P < 0.01 for trastuzumab groups vs. control. Error bars: ± 2 SEM. (B) Cell viability in HCC-1954 cell line following trastuzumab treatment as described in Figure 8A. (C) Cell viability in trastuzumab-resistant MDA-MB-453 (R) compared to the untreated control and control line treated with trastuzumab at 20 μg/ml. *P < 0.01 for R vs. treated control cells. (D) Combination indices (CI) for flutamide (FLU) and CI-1040 combination therapy in MDA-MB-453-R line using MTT assay. Therapies were carried out with flutamide at 5 and 10 μM with each concentration of CI-1040 at 5 and 10 μM (CI-5 and CL-10). The concentrations of fluatmide and CI-1040 monotherapies with an effect similar to that of each combination therapy are depicted. Error bars: ± 2 SEM. (E) Western blot analysis was used to measure the phosphorylated (ph) and total ERK levels in MDA-MB-453-R, control MDA-MB-453 and control MDA-MB-453 treated with trastuzumab at 20 μg/ml concentration (CTL + Tras). Fold changes in band densities (RR) were measured relative to the control. (F) Western blot analysis was used to measure the phosphorylated and total ERK levels in MDA-MB-453-R line following combination therapies with CI-1040 (5 μM)/flutamide (5 μM) and CI-1040 (5 μM)/flutamide (10 μM). RR values were measured relative to the untreated MDA-MB-453-R line. Next, we generated a trastuzumab-resistant MDA-MB-453 line (MDA-MB-453-R) as described in Materials and methods. We confirmed that MDA-MB-453-R cells are resistant to trastuzumab at 20 μg/ml concentration using MTT assay. MDA-MB-453-R line showed a level of cell viability in the presence of trastuzumab similar to that observed in untreated control line (Figure 8C). In contrast, the control line demonstrated a significant reduction in cell viability following trastuzumab treatment at 20 μg/ml concentration for 48 hours (P < 0.01, Figure 8C). Subsequently, we calculated CI values to assess synergy between flutamide and CI-1040 in MDA-MB-453-R line. Flutamide and CI-1040 treatments were carried out at the same four dose combinations applied before in the nonresistant line (CI-1040 (5 μM)/flutamide (5 μM), CI-1040 (10 μM)/flutamide (5 μM), CI-1040 (5 μM)/flutamide (10 μM), and CI-1040 (10 μM)/flutamide (10 μM)). Importantly, we observed a synergy at all four dose combinations in MDA-MB-453-R line with CI values of 0.68 to 0.76 (Figure 8D). The synergy between flutamide and CI-1040 in MDA-MB-453-R line raises the possibility of a functional role for ERK phosphorylation in the process of trastuzumab resistance in molecular apocrine cells. 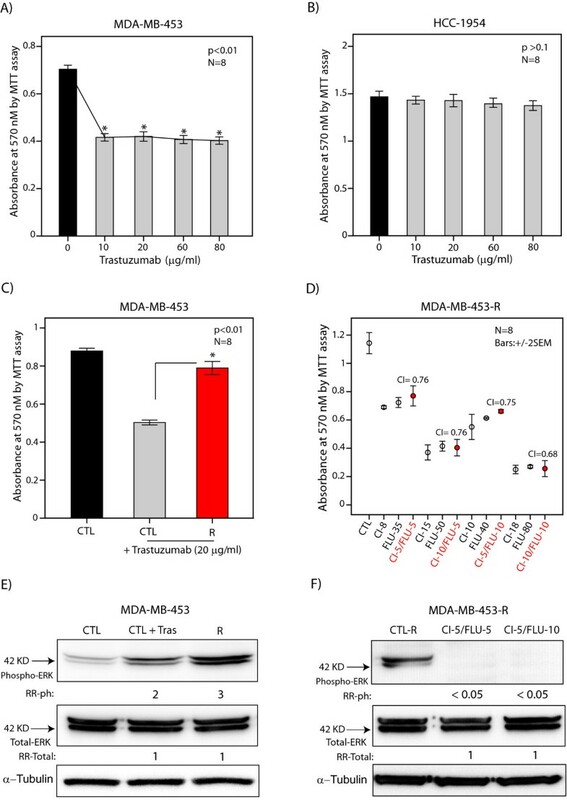 To investigate this possibility, we assessed the level of phosphorylated and total ERK proteins in untreated MDA-MB-453 control, MDA-MB-453 control treated with trastuzumab at 20 μg/ml, and MDA-MB-453-R cell lines. Importantly, MDA-MB-453-R line showed a threefold higher level of ERK phosphorylation compared to that of untreated control (Figure 8E). In addition, there was an induction of ERK phosphorylation by twofold following trastuzumab treatment for 48 hours in the control line (Figure 8E). It is notable that there was no difference between the levels of total ERK across these experiments (Figure 8E). Moreover, combination therapies with CI-1040 (5 μM)/flutamide (5 μM) and CI-1040 (5 μM)/flutamide (10 μM) completely abrogated ERK phosphorylation in MDA-MB-453-R line (Figure 8F). Taken together, these data suggest that the synergy between flutamide and CI-1040 can overcome trastuzumab resistance in molecular apocrine cells. In addition, this combination therapy abrogates the induction of ERK phosphorylation observed in trastuzumab-resistant cells. Management of ER-breast cancer is challenging due to the limited therapeutic targets available in this disease. Heterogeneity of ER-breast cancer contributes to this challenge, and therefore identification of novel targeted therapies requires a robust biological understanding of different ER-subtypes. We have recently identified a positive feedback loop between the AR and ERK signaling pathways in molecular apocrine subtype of ER-breast cancer . In this process, AR regulates ERK phosphorylation and kinase activity as well as the phosphorylation of ERK target proteins RSK1 and Elk-1 . Notably, AR inhibition using flutamide abrogates ERK phosphorylation in a dose-dependent manner, and AR activation using DHT leads to an increase in ERK phosphorylation mediated through ErbB2 . In turn, ERK signaling regulates AR expression mediated through transcription factor CREB1 . In this study, we explored the therapeutic implications of the AR-ERK feedback loop in molecular apocrine breast cancer. This was investigated using the combination therapy with AR and MEK inhibitors, which are clinically available and constitute effective targeted therapies to block the AR and ERK signaling pathways, respectively [14, 16]. We applied CI-1040 and PD0325901 for in vitro and in vivo inhibition of MEK, respectively. This approach was used due to the fact that CI-1040 has been commonly used to study the effect of MEK inhibitors on cell lines and PD0325901 is a derivative of CI-1040 with a better oral bioavailability, which makes this agent more suitable for in vivo studies [19, 21–23]. Importantly, we demonstrated synergistic CI values for the combination therapy with AR inhibitor flutamide and MEK inhibitor CI-1040 across three molecular apocrine cell lines (Figures 1 to 4 and Table 1). Furthermore, this synergy was present at four dose combinations in each cell line using both cell viability and apoptosis assays, suggesting a reproducible synergy between flutamide and CI-1040 in molecular apocrine cells. 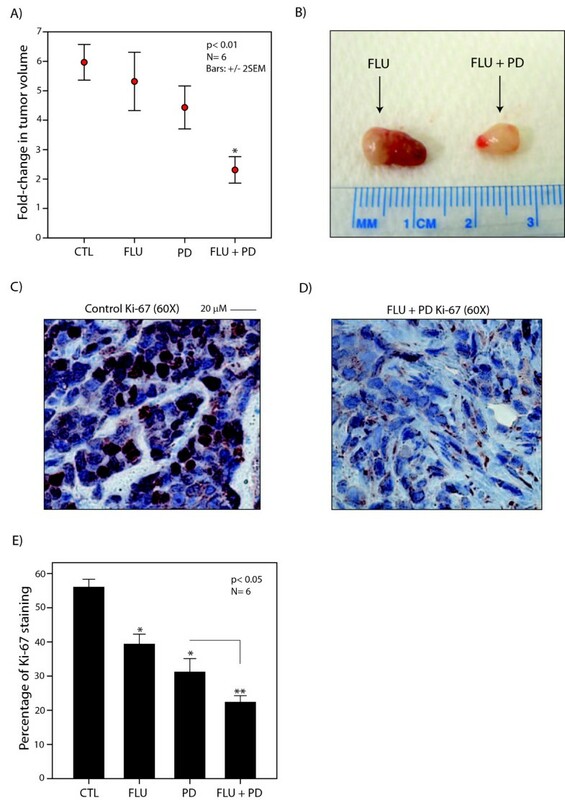 Moreover, we showed in vivo that the combination therapy with flutamide and MEK inhibitor PD0325901 has a significantly higher therapeutic efficacy in reducing tumor growth, cellular proliferation and angiogenesis compared to monotherapies with these agents in a xenograft molecular apocrine model (Figures 6 and 7). A combination therapy approach provides an attractive option in the management of ER-/AR+ breast cancer, since it exploits the synergy between AR and MEK inhibitors and at the same time minimizes their potential toxicities by requiring a lower dose of each agent in the combination setting. This is particularly relevant for MEK inhibitors, as higher doses of these drugs have been associated with significant toxicities in clinical trials [27–29]. In fact, our in vivo data clearly demonstrated that higher doses of PD0325901 have toxicity in mice, and this was absent at the 5 mg/kg/day dose used for the combination therapy studies (Figure 5). Another advantage of using lower doses of PD0325901 and flutamide in xenograft studies is to show an in vivo synergy between AR and MEK inhibitors. A similar approach has been previously applied to assess in vivo synergy for other agents [30, 31]. Notably, we observed that monotherapies did not significantly reduce tumor growth in mice, and therefore a markedly lower tumor growth with the combination therapy compared to that of control and monotherapy groups suggests an in vivo synergy between flutamide and PD0325901 (Figures 6A and 7A). The AR-ERK positive feedback loop forms the molecular basis for the synergy observed between AR and MEK inhibitors . This is supported by the fact that flutamide synergistically enhances the effect of MEK inhibitor CI-1040 in reducing the level of ERK phosphorylation in molecular apocrine cells . In addition, CI-1040 treatment results in a reduction of AR expression in molecular apocrine cell lines . Furthermore, we have previously shown a synergy between flutamide and Cdc25A inhibitor PM-20 in molecular apocrine cells that was associated with a decrease in the phosphorylation levels of ERK target proteins RSK1 and Elk-1 . Therefore, cross-regulation between the AR and ERK signaling pathways provides an attractive therapeutic target in molecular apocrine breast cancer. Moreover, a number of potent second-generation AR inhibitors such as abiraterone and MDV3100 are currently being studied in androgen-refractory prostate cancer [32, 33]. Since there is growing evidence to support the role of AR as a target for therapy in molecular apocrine breast cancer, the new AR inhibitors may potentially provide additional treatment options in the management of this disease. ErbB2 amplification and overexpression are present in at least 50% of molecular apocrine tumors, and the affected patients are usually started on trastuzumab early in the course of their disease [7, 8, 25]. However, there is a high rate of intrinsic resistance to trastuzumab monotherapy among patients with ErbB2-positive breast cancer, ranging from 66% to 88% [26, 34]. Furthermore, patients with a primary response to trastuzumab monotherapy have a short median time to progression of only 4.9 months . As a result, trastuzumab monotherapy is commonly combined with chemotherapy agents to increase response rates and time to disease progression; however, this approach is associated with more side effects [35, 36]. In this study, we demonstrated that flutamide and CI-1040 combination leads to a synergistic reduction of cell viability in HCC-1954 and MDA-MB-453-R cell lines with intrinsic and acquired resistance to trastuzumab, respectively (Figures 2C and 8A to 8D). Therefore, combination therapy with AR and MEK inhibitors may provide an effective treatment option in ErbB2-positive molecular apocrine patients with trastuzumab resistance. A number of different mechanisms have been proposed for trastuzumab resistance, including compensatory signaling and altered downstream signaling [26, 37, 38]. We found an increased level of ERK phosphorylation shortly after trastuzumab treatment in molecular apocrine cells (Figure 8E). This effect on ERK phosphorylation following acute exposure to trastuzumab has been reported in other ErbB2-positive cell lines and is similar to MAPK/ERK activation in cells stimulated with exogenous ErbB ligands [39, 40]. Importantly, we observed that the level of ERK phosphorylation further increased in trastuzumab-resistant MDA-MB-453-R cell line, which was abrogated following flutamide and CI-1040 combination therapy (Figures 8E and 8F). These findings are in agreement with the previous reports that trastuzumab-resistant cells are exquisitely sensitive to MEK inhibition . Therefore, the observed induction of ERK in trastuzumab-resistant molecular apocrine cells may render these cells dependent on MAPK/ERK signaling and sensitizes them to the synergy between AR and MEK inhibitors. In this study, we investigated the AR-ERK feedback loop as a therapeutic target in molecular apocrine breast cancer and demonstrated in vitro and in vivo synergies between AR and MEK inhibitors in this subtype. Furthermore, we showed that the combination therapy with these inhibitors can overcome trastuzumab resistance in molecular apocrine cells. Therefore, a combination therapy strategy with AR and MEK inhibitors may provide an attractive therapeutic option for molecular apocrine breast cancer. Future clinical trials are required to test the application of this approach in patient management. We thank Ms Kim Woolley from the University of Queensland Biological Research Facility for assistance with animal work. This study is funded by grants from the University of Queensland Pathfinder Program; Queensland Department of Employment, Economic Development and Innovation; and Princess Alexandra Hospital Private Practice Trust Fund. KMC is supported by a Cancer Council Queensland Scholarship. AN is named on a patent application related to the content of this manuscript. All other authors declare that they have no competing interests. AN conceived the study, designed the experiments and drafted the manuscript. AN, KMC and JL carried out the experiments. All authors read and approved the final manuscript.